He’s got the whole world…. So it’s apparent that this card of the world is full of symbolism. It has been said by many esotericists and occultists that the cards of the tarot can never be defined in an exhaustive and completely definitive treatise. Why? 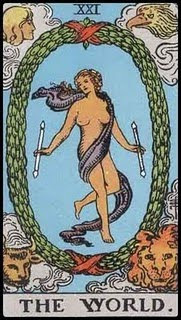 Mainly because the tarot is composed of a picture color alphabet which brings archetypes to the conscious mind of the practitioner. As this experience is extremely rewarding and pays handsomely in all practical and theoretical manners, we still must accept the language and knowledge acquired is that of a “Symbol”,. Its not the essence of knowledge but a mechanism that enables the mind to be receptive to the transformative experience, which some authorities call genuine insight or gnosis. in short it may be termed a technology at best. Here we will take very deep notice of the wreath. it is in an oval which we will not take long to realize that the egg of the world is what humans are being incubated or danced in. the idea of dance especially brings forth ideas of the Sufi poet, Jalladin Rumi. His view on dancing is that the dance is practiced as a form of union with the universe and was practiced by his order frequently as a path to self transcendence. marked in standard units or by comparing it with an object of known size . standard units or comparison. a quote by PF Case would be appropriate here “The wreath is an ellipsoid figure. Its longer axis is exactly eight units, and its shorter one exactly five units. Thus a rectangle which would exactly contain it would be eight units high and five units wide”. complex scale in music theory. was the force behind the bull’s manifestation. the archons” and “origin of the world” in the Nag Hammadi codex . backwards.to its source which again is in the elements. for our imprisonment and distraction.